Official watch of the Air Race Classic for first place winners. 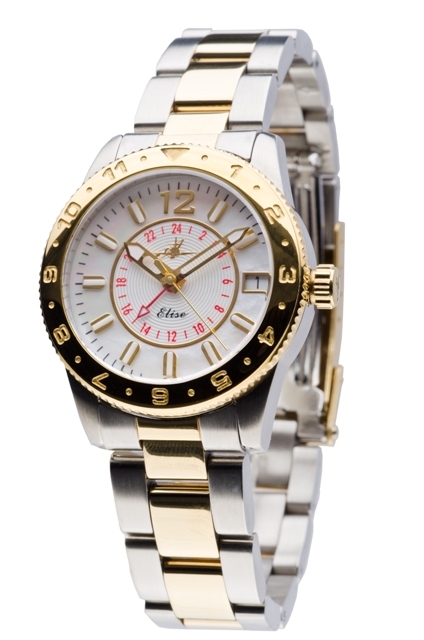 Tri-Time Zone watch in Tahitian Two-Tone Superior Ionic 24k gold plating and softened stainless steel. Mother of Pearl cabin interior with Super Luminous hands and hour markings. Surrounded by a bi-directional rotating bezel. The ultimate travel watch. Trust us when we say, you won’t know why you went so long without it. Review: I have been keeping an eye out for a good flying watch for years. This is the first to fit my wish list of an analog face, water resistant, glow in the dark and adjustable outer bezel. I love the inner dial for additional time zones! No more counting on fingers and scratching my head to figure out Zulu time! The bezel ensures I remember when I am due to land. I fly a lot and in demanding conditions for work. It is refreshing to have an attractive tool up to help on the job, not some men's watch or half heartedly modified woman's watch.